Lacking innovation, scientists modify Aristotle's theory and pass it off as their own. Renewable energy is another approximation made by physicists to simplify a problem that is too difficult to solve. In the same way that a cow might be treated as a point mass from a million miles away, researchers are more than delighted to assume that the sun will last forever as an energy source, in order to further spoil the world into increasing its rate of energy consumption and dwarfing the copious amounts of energy wasted in luxuries such as the Large Hadron Collider. Inasmuch as scientists have been ungrateful toward their Creator, they have now turned to the blasphemous worship of nature, in particular, the sun and mother earth. Instead of finding ways to reduce human energy consumption, society is encouraged to continue in wastefulness in the hope that one day someone will have found out how to harness energy from the sun, wind, water or earth, allowing us to carry on chopping down trees and negating the efforts of the so-called "earth hour" in a millisecond's worth of high energy particle physics research. Other groups envisage defecation and corpses as a power source for vehicles. However, by the time this becomes viable, the digestive system will have evolved to be so efficient that no caloric energy would remain in any organic waste. A method cheaper and much more sustainable than government-funded research is to suspend all technology for 50 million years or so and watch much of the world's population naturally convert itself into fossil fuel, whilst hoping that Armageddon does not occur during this period; this alternative is not very popular among academics, as it will leave most of them unemployed. Often referred to as nuclear energy at a distance, power generation consists of vast arrays of rectangular slabs that lie on roofs begging for rain. Although continuous exposure to ultraviolet light turns the panels black, most panel owners do not provide sunscreen nor headwear for their panels based on efficiency concerns; also, treatment for vitamin D deficiency is much more expensive than dumping panels outside the nearest cancer ward. After a few years of tanning, the hardiest panels are promoted and sent to desert areas which have lenses and mirrors that focus sunlight, where they spend their final months counting melanomas, one for each new employee soon to replace them. 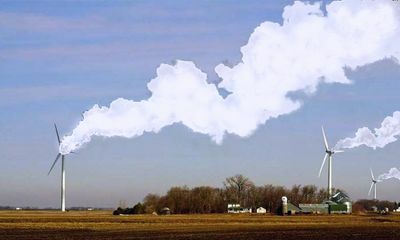 Wind turbines emitting harmless, zero-carbon steam as part of their normal operating process. Wind turbines produce energy by inducing frustration in residents who live nearby; the intensity of anger is proportional to the amount of sky blocked off by area, and its square when the turbine is not rotating. These angry residents are then able to go for months without food, automatically gathering in the streets to produce concentrated sound energy. A disadvantage of wind turbines is that the energy generated is extremely volatile, with small businesses taking the most damage in the case of a riot. Geothermal energy production consists of building power stations in places prone to earthquakes and volcanic activity. These provide daily hot spring baths, stone-cooked witchetty grubs and comfortable Winters for the workers, who live on-site. Once the station has been extended sufficiently deep into the ground, the workers may choose to reside either in the lower levels, where there is a better quality of life, or closer to the surface, where evacuation is simpler. Faith in Mao Tse-tung's policies provides immunity to pollution; no face-mask required. Renewable energy is used most efficiently by Green politicians to recycle Senate ballots to their parties without needing to enter into too many alliances. They present the argument of "long-term benefit" to promote renewable energy, which says that the energy obtainable from renewable resources is more than enough to outweigh the amount of fossil fuel it takes to mine the magical minerals used to make solar panels. However, in the real long run, the sun will eventually be depleted too, and the earth committed to fire and radioactive brimstone, so the problem is merely being delayed, not stopped. Politicians who are not Green do an even better job of utilising renewable energy to their advantage, for it is easier to maintain disbelief than to call for repentance when the end is sufficiently far away. Also, with developing countries like China whining to continue consuming coal and other junk food because they came late to the dinner table, it just doesn't make sense to waste food that is good to eat by leaving it in the fridge, or in Tony Abbott's case, his backyard. Renewable energy is the subject of many fictional works. Except for the occasional solar advertisment, renewable energy receives a generally negative light in the media, depicted as either unused or misused. In Avatar: The Last Airbender, the technologically sophisticated Fire Nation was well capable of renewable energy production simply by breeding more fire benders, but could not resist the Imperialistic urges of pillaging the Middle Eastern Earth Kingdom and frying some cleanly shaved nomads. Similarly, The Matrix fuels the public with the view that computers might restart a frenzy in Atenist worship via solar panels, and that installing eternal night and switching to geothermal underground might be a good idea to counter this. Consequently, the machines turned to human energy, an initiative currently being sponsored by Chevron. This page was last edited on 9 June 2015, at 02:37.